Why Communication & Rhetorical Studies? The Integrated Marketing Communication (IMC) emphasis provides a rigorous foundation in a strategic communication discipline that brings together advertising, public relations, and marketing communication. The Corporate Communication emphasis prepares students for communication management and leadership positions in both for-profit and non-profit organizations. The Rhetoric & Philosophy of Technology emphasis focuses on the ethical engagement of technology in personal and professional life. The Communication Studies emphasis is a flexible program that draws from the richness of the communication field to allow students to pursue a number of interests and professional goals. A 36-credit (12 courses) M.A. in Rhetoric & Philosophy of Communication for those interested in pursuing a Ph.D. degree, with courses in Philosophy of Communication, Rhetorical Theory, Argumentation, Free and Responsible Speech, Political Communication, and others. Pittsburgh and southwestern Pennsylvania are part of a rapidly growing market with strong technology, financial, education, healthcare, and non-profit sectors. Communication graduates have the flexible, intellectually sophisticated skill set necessary to take advantage of the emerging opportunities in the region's economy. Our department consists of nationally known scholars, outstanding students, and executive faculty drawn from top communication firms. Our founding corporate partnerships with MARC USA (an advertising and integrated marketing communication agency) and Ketchum Public Relations strengthen our ongoing emphasis on communication research and development. We conduct research and development in integrated marketing communication, advertising, public relations, corporate communication, intercultural communication, and persuasion in the marketplace. We are committed to engaging creative research and development in applied communication. We believe that it is essential to develop the skills, the knowledge, and the conscience of the next generation of communication leaders, who will shape the world that they inherit. Our educational environment invites innovation, diversity, resilience, and moral values in a changing world. We consider questions of communication ethics across the curriculum, not just in a capstone course for our students. For our faculty, staff, and students, the engagement of communication ethics is what Alexis de Tocqueville and Robert Bellah et al. call "habits of the heart." As part of the Duquesne community, we offer the finest contemporary professional education, distinguished by a solid foundation in Catholic values, the humanities, and practical application. We educate communication engineers, not communication technicians, providing students with the knowledge, skills, and expertise to solve practical problems in all areas of communication. Our graduates understand the importance of theory informed practice and action. They "walk" ideas into the marketplace and effect positive change. M.A. in Rhetoric & Philosophy of Communication graduates continued their studies at numerous institutions, including: Duquesne University, Bowling Green State University, University of Massachusetts-Amherst, and Purdue University. A great way to learn more about Duquesne, Pittsburgh, the admissions process and financing your degree is to join our contact list. 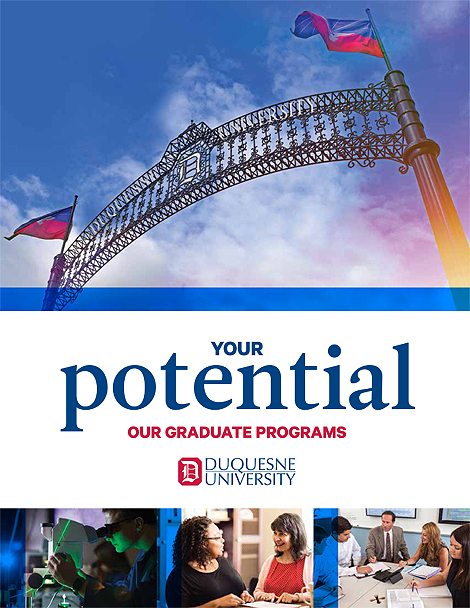 We'll send you regular communications and updates about your program of interest and opportunities here at Duquesne. Once joining, you will also receive access to a .pdf version of our Graduate Admissions Viewbook.